Thursday 19th March, a meeting concerning the Dinameeting Project was held at the “Giorgio Gaber” auditorium in the Lombardy Region with the Councillor for Artisans and Services, Domenico Zambetti, and the authorities of the Cestec and Politecnico of Milan, amongst the champion companies, the consultants and the selected companies. 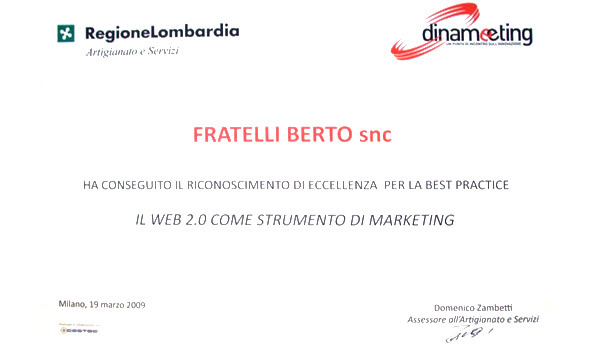 Berto Salotti received the prestigious “champion” company award together with 9 other Lombard companies, and will work together with a network of consultants to spread the best practices acquired over the years on the web 2.0. During the presentation, the champion companies were allotted time to present the project that obtained the candidature. Filippo Berto, the Berto Salotti marketing and communication manager then stated: “we are working on a table built with a very solid frame; we hold good cards and we want to play by facing this new economic course with the desire to win again”. The Dinameeting project promoted and put into effect by Cestec SpA (Centre for Technological Development, Energy and Competitiveness of small to medium businesses in Lombardy) is financed by the Lombardy Region and is aimed at small and medium businesses that wish to consolidate their competitiveness through the transformation and modernisation of their production, distribution and management processes.